New World Records are being set: Hard work, creativity, and motivation are the key components of success. Those make a mark in this world, who do something different. People around the globe are innovative and creative. There is an urge of creating something new and different. People are coming up with things that were never been thought of. Every day new records are being set. For instance, we have world records of the largest shoe, longest dress, fastest car and much more. World's Heaviest Gold Set: It seems like the world is in wake of setting new records. In this race, Saudi Arabia also made its mark when Saudi gold and jewels company, Taiba, created the world’s heaviest gold set. The beautifully designed set is a proof of great art and perfection. 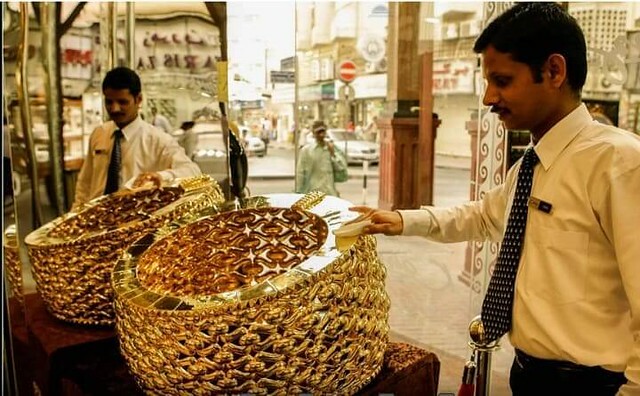 33 Kg Gold Set worth SR 6 million: People around the world were amazed by the magnificent set weighing 33 kilograms. The set is worth six million Saudi Riyals contains a necklace, a bangle, a ring and a pair of earrings. This 24-carat gold set was not made in a day or two; rather it required 100 professional gold designers working with dedication for about a year to create this masterpiece. 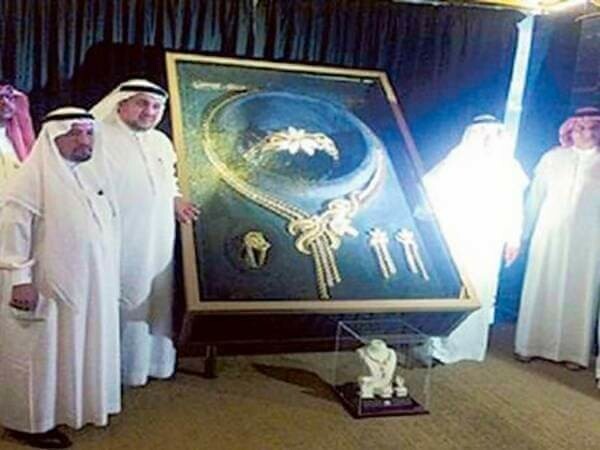 According to the company’s executive general manager, Mr. Essam Al Ashrafi, this creative task was undertaken by the jewelry makers to honor the Kingdom of Saudi Arabia. They wanted to cajole the Kingdom in their own style utilizing their skills and talent. Najmat Taiba: However, this is not the first time the company had impressed the world and set up a record. In 2000 Najmat Taiba got the attraction of jewelry makers and jewelry lovers. 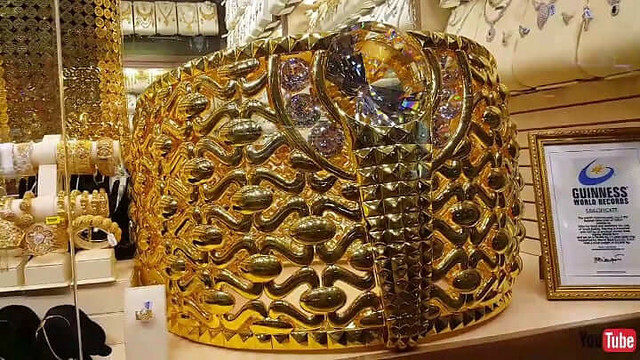 Najmat Taiba or star of Taiba is the world’s heaviest gold ring. The ring is finely created with a delicate design on it. The beautiful creation weighs about 58.68 kg and is heavily embedded with about 5.17kg of Swarovski stones. Not only the Ring got endorsed by the World Gold Council but also holds the Guinness book of world records certificate. Najmat Taiba drew the attention of the world towards itself. 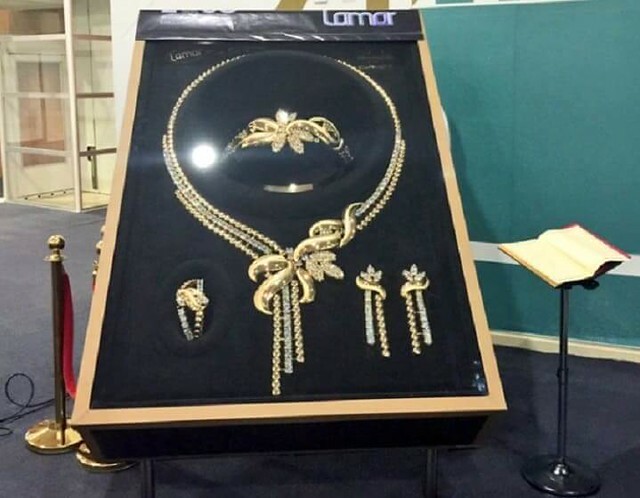 39th Mid-East Watch and Jewellery Show: People wanted to see the great symbol of creativity so much so that it was put up on display at 39th Mid-East Watch and Jewellery Show that took place at Expo Centre Sharjah on October 6, 2015. These records are appealing and depict creativity; however, it would have been much better if the nation is motivated to set the record of peace: being able to build a state where there is no poverty, no unemployment, and no crimes. We need to focus on the people of the Kingdom: It’s time to honor the Kingdom by making it the most peaceful place to be lived in. These fancy records help gain fame and attention but we need to focus on our people. We need to make our economy stronger and self-sufficient. These records do endorse creativity and hard work yet we need to be creative in solving the nation’s problems. We need to invest our time, money and dedication to meet the needs of the people, help the poor and make the state stronger. Nevertheless, these ornaments are the two most beautiful assets for Saudi Arabia.